Cambridge Audio Azur 851C review | What Hi-Fi? The Cambridge brand might have built its reputation on turning out high-quality budget kit, but the Azur 851C shows it’s more than capable of moving up a gear or three when the price goes up. Despite the page headings above, to call the Azur 851C ‘just’ a CD player is to do it a disservice. It’s far more than that, as even a quick scan of the features list shows. 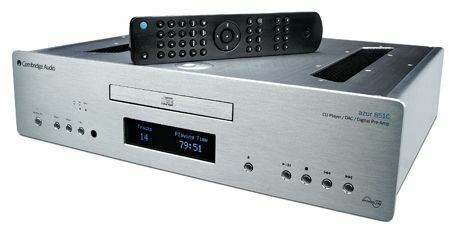 There are digital inputs, for starters, and alongside the now-standard trio of USB, optical and coaxial you’ll find the less common AES/EBU digital connection, too. All the inputs will accept a full-fat 24-bit/192kHz signal (bar the optical, which is limited to 96kHz). The company is especially proud of the digital-to-analogue design in this product. It up-samples the digital data stream up to 24-bit/384kHz, irrespective of whether the source is the built-in disc drive or a laptop. The advantage of doing this is claimed to be greater linearity of response from the DACs. A great deal of attention has also been paid to reducing jitter to minimal amounts. The aim is, as always, to deliver a better sound. The highlights don’t stop there: the 851C can also function as a digital preamp and switch digital sources, adjust left-to-right balance and take charge of volume levels. In a digital-based system all you’ll need to add is a power amp and pair of speakers. Or, if you want to get purist, the Azur 851C connected to a pair of active speakers is about as minimal as a system gets. The 851C is impressive out of its box. It’s a large and hefty unit, solidly put together and finished to a high standard. We like the remote control, too. It looks like a classier version of Cambridge’s standard wand. In use it sounds remarkably consistent, regardless of input. With a CD of Drake’s Take Care it delivers an impressively clean rendition. There’s a massive amount of detail and terrific precision in the way the 851C handles the leading and trailing edges of notes. The rapid-fire lyrics on Under Ground Kings, meanwhile, are easy to follow and delivered with plenty of finesse. Move on to the likes of Beethoven’s Moonlight Sonata and the player responds with an appealing lightness of touch. It uncovers harmonic nuances with ease, while still managing to deliver dynamic changes with authority. The insight this machine gives into the recording and production is excellent. Feed in a 24-bit/88.2kHz version of The Rolling Stones’ Let It Bleed and the 851C continues to impress. The extra resolution of this recording is readily apparent, as is the extra subtlety and fluidity on show. However, despite the Cambridge’s obvious talent, we’re not totally convinced. Regardless of the recording, it favours analysis over fun, making it easier to admire than it is to love. Major Lazer’s Pon de Floor should charge along, but instead it sounds a tad restrained, lacking the dynamic contrast and rhythmic coherence of the best. While something like Cyrus’s CD 8 SE2 isn’t as overt about the detail it digs up, it’s still a more exciting and involving listen. Trying the Cambridge as a preamp gives us mixed results. We like the clarity and resolution on offer, but can do without the loss of substance and hint of electronic edge using it in this configuration produces. Make no mistake; this Cambridge is an immensely capable performer. If detail resolution and precision are paramount, then dive right in – in those respects it’s as good as anything we’ve heard at this price. But it doesn’t manage to engage us in the way some rivals can. And that’s why it gains a four star rating.